The tail-end of winter this year has been a stressful and unpredictable one at times – especially for those in the northeast. Due to the increased risk of power outages during fluctuating weather patterns, it’s a good time to remind you about preparing your pellet stove for storms. First – is your stove plugged directly into the outlet, or do you have a surge protector? Most modern pellet stoves have a circuit board that can be damaged without protection from even small electrical surges caused by power outages. Be sure to check your manual for information on electrical recommendations. This device converts low voltage from batteries into voltage your pellet stove can operate on. Make sure the inverter is a Pure Sine Wave inverter and is at least 1000w. The batteries must be Deep Cycle ones. A UPS is an all-in-one option that contains batteries, a charger and what’s required to convert low voltage to mains voltage. These devices are typically only good for an hour or so of time – which can be used to safely shut down your pellet stove, or while getting your generator running. Of course, a generator is a common solution for reinstating a home’s power during an outage. The type and size that’s right for you should be determined after some solid research. If the power goes out while your pellet stove is operating, and you don’t have any backup system in place – the pellets won’t immediately stop burning…but the components controlling the heat distribution and circulation will cease. With no operating exhaust fan, your stove can fill with smoke which could leak into your home. You’ll need to carefully unplug everything and (unfortunately) open some windows until you can air out the room. 1. Should I do anything special when I turn off my stove for the summer? Turn off your stove and unplug it. (You should have a surge protector.) Let it cool completely before you begin the process. Start by cleaning the glass with your heat-safe cleaning solvent and a soft cloth, like you have been doing through the heating season. Do NOT use any cleaning solvent with ammonia in it, because it can damage the glass. Clean out the entire inside and within the hopper, to the best of your ability. If you have a stove vacuum, this will help make sure everything is removed. (Do NOT use a household vacuum because the fine ash can damage it). Or you can always rely on a trained stove technician to use his or her professional tools. Do NOT leave any wood pellets inside your stove – burned or unburned. Wood pellets are made of kiln-dried, fine wood fibers which will absorb any moisture. If you have moisture inside your stove, the leftover pellets will absorb it and can cause rust to form through the summer, which can create costly damage later. For this same reason, cleaning out all the ports and passages inside your stove is important for your stove’s health. If you are unable to safely get inside the inner parts of your stove, and have never done so before, we do not recommend this without professional help. Not only are clean passages a best practice for when your stove is shut down, but also during the burning season as well. Make sure to check your owner’s manual for any suggestions that might be specific to your brand of pellet stove. For an extra precaution, schedule a summer cleaning/inspection by a trained pellet stove professional technician. Note: Cleancare Professional Cleanings are available through our trusted, certified pellet stove technicians in some regions. Give us a call at 1-800-PELLETS, or enter your zip code on our website to see if Cleancare is available in your area. 2. Do I really need to worry about creosote with my pellet stove? Your wood burning appliance’s venting system carries out the substances produced when wood burns. As the hot substances flow up into the relatively cooler chimney, condensation occurs, which results in creosote residue sticking to the inner walls of the chimney. Letting creosote accumulate can cause a house fire – which is (hopefully) common knowledge among wood-burners. Although pellet stoves generate significantly less burn residue due to the clean kiln-dried wood fibers in pellets, it’s still critically important to clean and inspect your stove thoroughly, as you would a firewood-burning system. 3. Why is my flame so weak? If your flame is weak, or “lazy”, you’re not experiencing the level of heat you should be getting. If it stays weak for an extended amount of time, your stove will likely just shut down. Causes for a smaller than usual flame are usually a part in need of replacement, incorrect air adjustments, or most common – an uncleaned/neglected pellet stove. Pellet stoves work off of pressurized air, which is drawn from the exhaust. Pet hair, dander, dust and lint are constantly sucked in. 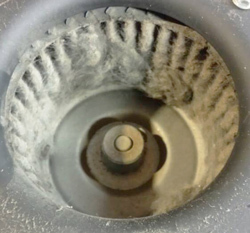 If all the passages within your stove haven’t been cleaned out, or your exhaust hasn’t been cleared of debris – air cannot circulate efficiently. Therefore, your flame will not be strong. Aside from occasional tired parts that need replacing, this is more commonly the answer to why you have a weak flame. 4. Should I be burning hardwood or softwood pellets? Firewood burners prefer to use hardwood in their wood stove or fireplace, because it provides a longer burn compared to softwood due to wood density differences. However, regardless of the type of wood used to produce wood pellets, the pelletizing process produces pellets with the same density. Due to a higher percentage of resin content in softwood, more heat is produced per pound. Therefore, softwood pellets are typically the most popular among pellet stove owners. 5. Why am I getting so much ash? Check out the specifications on the wood pellets you’re purchasing, and look for the ash content listed. The higher the percentage, the more ash you’ll get, and the more frequent your cleanings will be. Higher quality pellets will have lower ash percentages, and therefore less maintenance. On top of research, another great way to choose a fuel is by talking to your fellow pellet-burners to see what they’re using and why. Of course, you won’t know what you like for your home and your budget until you run your own tests. But if you’re buying the cheapest pellets with lower heat and higher ash specifications – you shouldn’t expect the same results as the higher quality options available. Questions? Need to Place an Order for Premium Wood Pellets? Shop Online or Call 1-800-PELLETS to Speak to a Woodpellets.com Representative!